This image shows "active asteroid" P/2012 F5 in 2014. The lower image shows the fragments without the dust trail, for better visibility. An odd asteroid rotated so fast that it blew itself apart, a new study suggests. 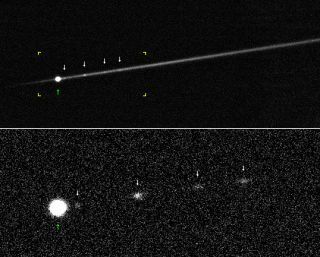 Researchers using the Keck Observatory in Hawaii spotted four fragments of the asteroid, known as P/2012 F5, and also determined that it completes one rotation every 3.24 hours. The space rock is thus spinning fast enough to spontaneously break apart, study team members said. "This is really cool because fast rotation has been suspected of catapulting dust and triggering fragmentation of some active asteroids and comets," study leader Michal Drahus, of the Jagiellonian University in Poland, said in a statement. "But up until now, we couldn't fully test this hypothesis, as we didn't know how fast fragmented objects rotate." The research could help scientists better understand mysterious "active asteroids," which shed material like comets do. So far, scientists have found four of these unusual objects, each of which is 0.6 miles (1 kilometer) wide or smaller, Keck officials stated. There are two leading hypotheses for how such asteroids become active. The first posits that they collided at high speed with another minor object. The second idea holds that active asteroids are rotating so fast that they generate centrifugal forces that exceed the force of their own gravity. "Rotational disruption is the expected final state of what is called the YORP [Yarkovsky-O'Keefe-Radzievskii-Paddack] effect — a slow evolution of the rotation rate due to asymmetric emission of heat," Keck officials wrote in the same statement. The new study, which was published last month in The Astrophysical Journal Letters, bolsters this latter idea. But the explosion hypothesis isn't a slam dunk yet. The study team noted that there are faster asteroid rotators out there that don't exhibit "mass loss." And with so many pieces of debris flying around in the asteroid belt, collisions could still be a factor, the researchers added. P/2012 F5 lies in the main asteroid belt between Mars and Jupiter. The object was initially identified as a comet when Alex Gibbs, of the Mount Lemmon survey in Arizona, discovered it in March 2012. Further analysis, however, revealed that all of P/2012 F5's dust apparently came off in a big surge in 2011. This doesn't happen with comets, which instead shed gradually as the sun's energy bleeds dust and gas away from the surface.